Colombia, a land of 37 million lying at the northwest region of South America, has long been one of the most active nations in the sport of chess. GM Alonso Zapata is perhaps the most famous player and remains as the country's top player. However, other players are rising. One such player, among others is Jorge Renteriá. 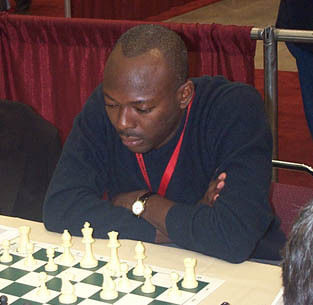 During an interview at the HB Global Chess Challenge, he explained that he hails from the Afro-Colombian enclave of Chocó. Upon further research, one finds that Chocó is a coastal province settled by Africans, but became the primary areas of Portuguese and Spanish slave-raiding prior to Columbus' expeditions to the "New World." Scholar Dr. Ivan Van Sertima writes about these civilizations in his book, They Came Before Columbus. Colombia's African descendants represent 30% of the nation's population. Renteriá graduated from Fundación Universidade Central and works as a journalist for La Quilla magazine. He stated that he had read literature by Frederick Douglass and had taken an interest in the socio-political struggles of African-Americans. Colombia is struggling to find answers to the socio-political problems that have plagued people of African descent. The Department of Chocó is often mentioned when highlighting the plight of the Afro-Colombians. Renteriá's e-mail address has the prefix "orula." During an interview I asked him what that meant and he mentioned that it was an African deity that protects people from danger. Interesting. Jorge (pronounced 'horhay') Renteriá speaks with pride of his country and of his chess compatriots. Colombia has long been a participant of international chess tournaments and he mentioned Zapata, GM Gildardo Garcia, GM Alexis Cabrera, FM Mauricio Uribe and Jaime Cuartas. Note: I remember back in 1982, a Colombian under-26 team came to Chicago for the World Youth Team Tournament. I saw Zapata (an IM at the time) successfully giving Marvin Dandridge 5:3 blitz odds. Dandridge is a phenomenal blitz player and tactician and it was an amazing sight to see. At that time, there were no Afro-Colombians on the youth team and I doubt there was much of a presence of Black chess in the country. 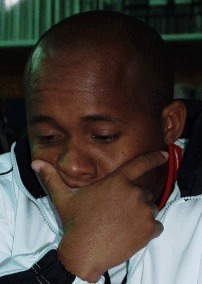 Renteriá mentioned that Afro-Colombian players have begun to make an impact. IM Miguel Mosquera is a player who has shown tremendous potential and has represented Colombia in three Olympiads. His best score came at the 2004 Olympiad where he scored 7½-4½ (2539 TPR) on board #1 for a GM norm. With a 2394 rating and no title at the time, he beat GMs Pablo Ricardi (Argentina), Eduardas Rozentalis (Lithuiania), Dashzaveg Sharavdorj (Mongolia) and held Evgeny Agrest (Sweden) equal. Mosquera's games show a lot of energy and determination. His game against FM Mok Tze Meng at the Istanbul Olympiad shows that he is also tactically alert. Renteriá also played in the Istanbul Olympiad scoring 5-5 as a reserve and played in Spain scoring 6½-2½ in the 2004 Benidorm Open. At the HB Global Chess Challenge he scored 5-4, but had to endure five rounds in one day (3-day schedule)! He stated that it was a good experience and hopes to be back. Notes: I asked Renteriá if he knew of Colombian-born Pontus Carlsson and he stated that he did not, so I explained to him the history of this fine talent. Carlsson was raised in Sweden and is currently studying Spain. He also earned four IM norms and should be awarded the IM title in the next conferral. When I asked him if he met IM Amon Simutowe, he stated that he knew him because Colombia defeated Zambia 2½-1½ in the 2000 Olympiad! 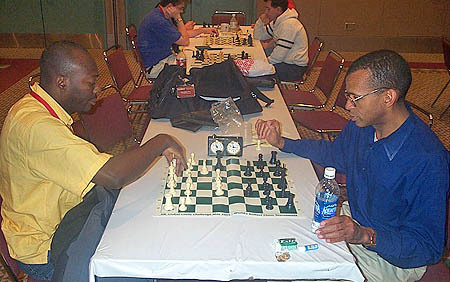 According to Colombiana de Ajedrez (www.ajedrezencolombia.com), the National Championships will begin on July 14th, 2005 and will feature the top players in a 10-round format. Mosquera is listed as one of the participants. Now that Renteriá has set a trail to "North America," perhaps we will see other Black players from "South America." Listen to interview, "Jorge Renteriá at HB Global Chess Challenge"
Jorge Renteriá playing blitz with Stephen Muhammad at HB Global Chess Challenge.